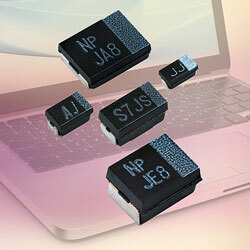 Vishay Intertechnology has extended its T55 series of vPolyTan surface-mount polymer tantalum moulded chip capacitors with new devices in the Z case (EIA 7343-19) size. With a 0.1mm lower height than devices in the standard V case, the Vishay Polytech capacitors increase package density and allow the design of thinner end products. The devices are optimised for power management, battery decoupling, and energy storage in servers, computers, network infrastructure equipment, solid-state drives, and wireless transceivers. Provided in the compact J, P, A, B, T (low-profile B — 1.2mm max), D, V, and Z case sizes, the series highlights a broad capacitance range from 3.3µF to 680µF over voltage ratings from 2.5V to 63V, and capacitance tolerance of ±20%. The capacitors provide ultra-low ESR from 500mOhm down to 7mOhm at +25C, a result of their polymer cathodes, which provide considerably enhanced performance over manganese dioxide devices. Capacitance values up to 1000µF and ESR values down to 6mOhm are in development. Operating over a temperature range of -55C to +105C, the capacitors provide excellent ripple current rating up to 5.66A IRMS and provide low internal resistance for enhanced charge and discharge characteristics. Featuring lead (Pb)-free terminations, the series is RoHS-compliant, halogen-free, and Vishay Green. The devices are compatible with high volume automatic pick and place equipment and offer a Moisture Sensitivity Level (MSL) of 3.